In the previous blog, I mentioned how it’s as easy to take a flogging in the American marketplace as a Mexican plazuela. In few areas of American life is this more evident than in your relationship with your mobile carrier. Will the phone you buy today be appropriate for expat life? Will your two-year contract be what you want when internet options (especially WhatsApp) are what expats use? Will your data needs be the same? I first learned of the abuse of the carriers domestically. At one point years ago, I was paying Verizon over $80 a month for the privledge of suspending my account while I was in Green Bank, West Virginia, which isn’t in their service area. What I got in return for that $80 a month in addition to no service was my phone message being replaced with their disconnect message. I have repeatedly been given estimates of what my bill would be based on past usage (which is practically zero while I’m in Mexico), then charged double those estimates. I came back to Denver once to discover that my service contract was mysteriously extended for six months without my knowledge, which required an hour long in-person intervention in Denver to resolve. That was in Year One in my expat journey. This blog promotes the premise that you can live a more fulfilling life in two countries for less than living in the U.S alone. When you live part-time in Mexico, you find out that nobody there pays these outrageous prices for phone service. They all use the internet (WhatsApp is the most popular) for their international phone calls and texting. So can you. You can use Magic Jack internet-based calling for your domestic calls when you are in the U.S. if you want to. I did it. I was so fed-up that I made strictly internet calls using Magic Jack ($35 year) for a year before finding an AT&T plan in Mexico for $10 a month that would give me unlimited calling to and from Mexico. What began as a research hassle; delving through technical information and forums, I eventually came to embrace as an opportunity to divorce myself (and maybe you), from telecommunications racketeering forever. Figuring out how to manage cell phone communications at a reasonable cost between two countries is part of figuring out how to have the best of both worlds. Living abroad gets you used to exploring communications options. The world becomes alive with opportunities when you become part of the international community. You feel like a rebel. You are a rebel just be virtue of the expat lifestyle, which by definition implies you are dissatisfied with the status quo. Doing things differently from the rest of the world took 10 years off me. It can be confusing and complicated. The year or two before you actually start making trips is the time to take the first bite of the elephant, when you can still go into a carriers office and demand answers in English. The links below should give you starter ideas of how to rid yourself of both the excessive cost of your phone bill and the accompanying indignation of being bent over every month to pay it, which is almost as bad. Do I sound angry? Good. I work to maintain that anger to sustain me when everything doesn't work perfectly. For me, being tied to an American monthly phone contract when I live in Mexico a big part of the year was clearly not an option. When I had a contract, each time I returned, I'd have to go in and change the plan back to the domestic-only plan. While I was gone, I had to go through all kinds of contortions to make things work and worried constantly about unwittingly incurring roaming charges. I still kept a presence in the U.S. I wanted to keep the same phone number that I had through my marriage, divorce, move to Denver, and 20 years of other escapades. At first, I ported my number from Verizon to Google Voice ($20). Ultimately this was not necessary as I eventually ended up with internet based phone service through Magic Jack and could have ported my number directly there. At the time however, I just wanted out. To make unlimited internet calls without a regular carrier, In addition to Magic Jack, you can also subscribe to Skype Premium, which allows you to make unlimited calls for $60 signup fee. Recently, I also began to use Zoom for international video calling. It's less glitchy than Skype (But I get a lot of push-back from friends who have gotten used to Skype). .Your next smart phone should be unlocked. You can unlock your phone in Mexico but it's a little bit of a hassle unless your Spanish is good and you know your way around enough to find a reputable place.If you want to unlock your current phone, do it in the U.S. as soon as your contract is up. By unlocking your phone, you will be able to move between carriers. For several years, unlocking you phone was illegal (I wonder who was behind that? ), but in 2015, President Obama signed the Unlocking Consumer Choice and Wireless Competition Act into law, finally making it legal once more to unlock your phone. It is once again legal as long as your contract is up. The carriers must either unlock the device themselves, give you instructions or facilitate the process through your phone’s manufacturer. Although most carriers won’t automatically unlock your device once you’re eligible, the FCC says the participating providers are to alert you when your device is eligible for unlocking. They also cannot charge you for it. Not only does unlocking your phone free you up for a new carrier, it gives you flexibility for more creative options, like mine or others. An unlocked phone is more valuable should you sell it, as the purchaser won't be locked into your carrier. Once in Mexico, with an unlocked phone and the ability to take a SIM card, you can replace the U.S. chip with a SIM card from a local carrier like Telcel or Movistar which allows you to use the phone in Mexico if you decide on a local plan there. Conventional phone service in Mexico is inexpensive. Mexico passed a number of laws in the last few years drastically lowering the cost of Mexican consumers. Going back to the subject of internet-based telephone services and apps, WhatsApp is the commonly favored app for free texting here. Others are GroupMe and IMessage although I have not tried them yet. The one I am most anxious to try and just downloaded is We Chat, recommended to me by my European Spanish practice partner and a former executive with Spain's largest telecom company. Some of my expat friends in Mexico who purchase plans go with with Vonage North America, a popular carrier with unlimited calling plans at a reasonable cost. Like Skype, Vonage calls require internet as well as their equipment, an adapter which you can take wherever you go. These are options I will look at when I decide to live here full-time. Like most temporary visitors to Mexico, while exploring the expat option I never made or took calls on my smart phone...too scary. I'd heard too many stories of $500 phone bills upon return to the U.S. The best thing to do for many people while they are initially visiting short-term is to keep their cell phone in airplane mode to guard against accidental, astronomical roaming charges and use internet-based services to call and text friends until a more long-term solution is chosen. During my first "tour," for those times when I needed to call someone in Mexico and no internet was available, I bought a cheap Telcel phone and purchased minutes at the OXXO convenience store or pharmacy for 200-300 pesos ($12-$15) every month or two. And you know what? After four years here, I still love that cheap little phone. It's tiny and can be carried in a pocket when I don't want to carry my expensive smart phone, which would be very expensive and a hassle to replace in Mexico. Whenever I return to the U.S, a friend in Mexico keeps the number active on the Telcel phone by depositing 100 pesos every few months for me. The number on the Telcel phone remains my primary Mexican phone number to this day. I could transfer the number to my smart phone if I only wanted to use just one phone. But I like the little thing. It's saved the day a few times. It only has phone numbers for Mexicans on it. When it rings, I know there's a Mexican at the other end. I love that. In the U.S. I can make local calls on the AT&T plan I signed up for in Mexico, and call to Mexico using their 52 country code as the prefix. The plan gives you a 1 gig of data too. for 200 (about ten dollars) pesos a month, no contract! The only gap in service is that I can't receive calls from the U.S. without internet, since the AT&T plan is unlimited calling out only. They call me on the number they always have, my old number that is now a Magic Jack number. I have to call them back on the AT&T line if the internet connection is poor. So far, my system runs pretty smoothly. I can make and receive calls on my smart phone over Magic Jack or WhatsApp when I have internet. I can make unlimited calls to the U.S. and Mexico when I don't have internet internet through the AT&T plan. Sometime the internet calls are clearer. Sometimes the AT&T calls are clearer. (You do have to use the country code, 001 when dialing the U.S. from Mexico on the AT&T plan though). You do need assure them it's okay to answer the phone when an exotic Mexico phone number shows up. This combination of Magic Jack and AT&T gives me everything I need to make and receive unlimited calls and texts between two countries from both directions, and more than enough data for my needs. All for about $22 a month. Before, I was lucky to have any bill be less than $115 a month. This was probably all a little confusing. Let me summarize. Magic Jack - The internet calling service lets me call to/from both countries. I ported my Verizon number to Magic Jack to keep the number I had for 20 years. I can receive texts but not pictures on Magic Jack. Telcel phone - A cheap tiny phone I use in Mexico when I don't want to carry my Iphone. I put sueldo on it every few months, about 100 pesos. It can make international calls too and the calls are not expensive. Once my smart phone went out in Mexico and I had to use it to warn my U.S. friends that I'd be incomunicado until I replaced it. The calls went through clean and clear. AT&T - A phone plan offered Mexico (that I pre-pay for the year at $10 a month before I return to the U.S.) allows me to call the U.S. from Mexico and make calls to Mexico from the U.S. using country codes (001 U.S./52 Mexico) and the number. It also gives me a gig of data. I tell my U.S. friends to use only the number they always have, my 804 -area code Magic Jack number. You have to make sure to tell them that, to not call your Mexican number. Do not answer their calls if they come over on your AT&T line as they will be charged international rates. Call them back. Give them the Magic Jack number. Ideally, you will port whatever number they’ve always called you on to your Magic Jack account. Too confusing and complicated? My system serves all my international calling, text and data needs and costs less than $25 a month. What does yours cost? Below are a few of the recent articles about the myriad of ways you are hosed every month by the big four carriers, including AT&T. I will update them continually as I am sure the gouging will continue and new articles will be written by writers who seem as pissed off as I am. How I Spend $20 a Month for Unlimited Text, Data and International Calls - After reading this article, I will definitely be checking out Mexican carrier Movistar. What’s the difference between CDMA and GSM technology? - Article by eBay on how to choose a phone for international travel. Next up: Do I have to pay income taxes in Mexico? Most recent: Know these things not to say to a Mexican. Hi, I'm Kerry Baker and a partner with Ventanas Mexico which provides insight and resources to people considering expat life in Mexico, whether full or part-time. 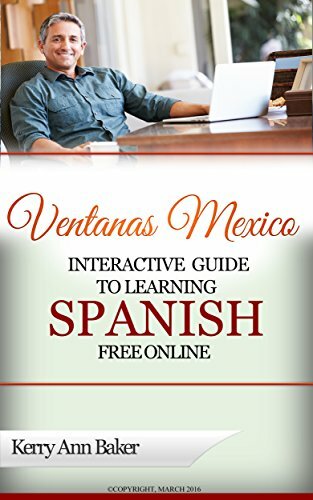 My book the "Interactive Guide to Learning Spanish Free Online," a curation of the best Spanish language tools and features on the web, with lesson plans, will introduce you via interactive links to the best fee Spanish language tools on the web. These are excellent resources you'd never find on a Google search. You can use the book's lesson plans or create a new plan every day from the tools in the book, like I do. Study anywhere with your laptop, e-reader or tablet, like the Amazon Fire. 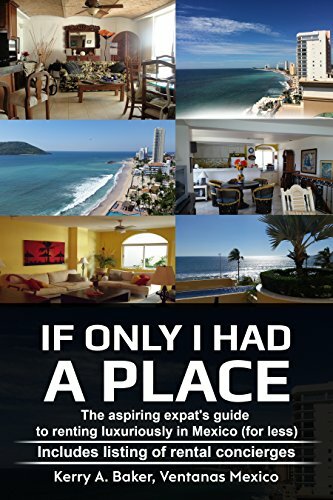 My second book, "If Only I Had a Place," is the aspiring expat's guide to renting in Mexico. The book will keep you out of trouble (renting in Mexico IS different) and will give you the cultural secrets to get the most bang out of your rental buck. Its listing of rental concierges are the people to call to preview your prospective apartment or house before you sign on.